At Just for Jeeps, we love talking to Jeep drivers. They have the best stories, about everything from where they've been to what they've done. Sometimes the action happens far away from a vehicle, but their Jeeps got them there - and by "there," we mean "crazy insane places where other vehicles don't stand a chance of reaching." It's no wonder Jeep drivers are so proud of their Jeeps. More than just a vehicle choice, their Jeep has become a reliable, functional part of their lives. They have a lot of love for the brand, and show it off wherever they can. The spare tire is the perfect place to display that logo. 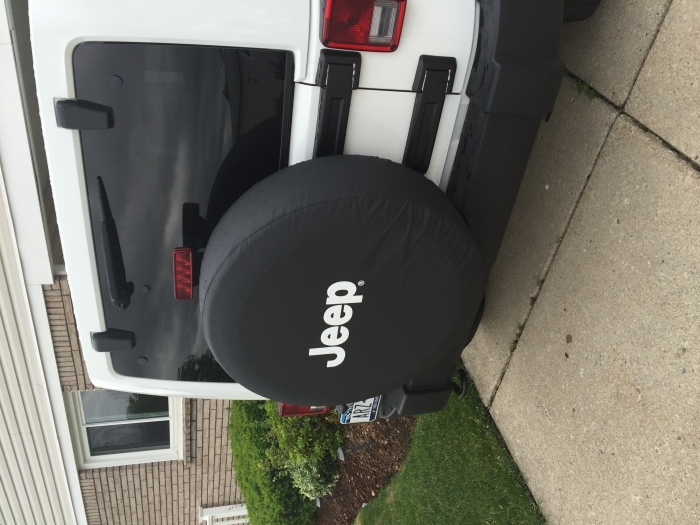 We offer Jeep logo tire covers made by OEM Mopar, the same company that equips Jeeps for the showroom floor. These covers are made of rugged black denim and feature that distinct logo in several different colors, including white, gray, black and silver. When you order, you'll be able to get exactly your size and color, matching the rest of your Jeep perfectly. And you'll enjoy that straight-from-the-dealer look at a fraction of the dealer price. Excellent cover. Dont know if it was a defect, or if it happened in a parking lot, but the cover ended up with a smal, clean rip after a few weeks. All in all, it is still working and my wife loves it. ProsNice looks, good color, fast shipping, fair price. High quality and great fit, didn't sag or lose its shape. This is a great cover that's not ostentatious and covers perfectly. It's dark lettering's seem almost three dimensional and is made of high quality denim. This will last a long time. Great product. Quality look and feel. Perfect fit. A great product, fast service and a good company to buy jeep accessories. Very happy with the product. Looks great and easy to put on. This was a perfect replacement for our Jeep Liberty. Great quality, great silver logo and this version is so much easier to use and secure than the original cover with the zipper. Great shipping, great product. Wil definitely buy from Just for Jeeps again. item was represented well. It fit great and was exactly what I ordered. My first spare tire cover arrived damaged. I called customer service and without any hesitation they sent me another one. I will always support an ethical company. I am extremely satisfied with my recent purchase. I chose a black cover with grey lettering which is beautiful. It fits my tire perfectly and is made with quality materials. After reading the other reviews, I knew I finally found what I was looking for plus it is made in the USA. Thank you for your wonderful product, service and quality! Fits perfectly, looks great and I'm very pleased how quickly I received it. Very good quality, fast shipping, will buy from you again. It was what I wanted. I thought the price was right. It was delivered quickly. I'm very satisfied. Looks clean and fits well. Have had it for a few weeks now and no issues. Installed easily and fits nice and snug. Too soon to tell how hard it will be to maintain its appearance. Wish it had a drawstring to close up the bottom part. ConsWish it had a drawstring, not that big a deal. The cover fit perfect and looks great! The quality is excellent. Received in just two days with basic shipping.